Earlier this month Deputy Willie Penrose introduced the Environment and Public Health (Wind Turbines) Bill 2012 into the Dáil. This follows the previous introduction by Senator John Kelly of the Wind Turbines Bill 2012 into the Seanad which failed to progress past second stage. The history of non-government, private member’s bills would suggest that this latest legislation is largely a political gesture with little chance of advancing into law. The current Government is a strong proponent of renewable energy and is currently negotiating with the British government to boost renewable exports to the United Kingdom. However, it does reflect the growing public and political unease in some rural areas with regard to the increasing number of planning applications for new wind farm developments. Note: Maps now updated with additional 750 metres analysis. Working with the research team at AIRO, we thought it would be an interesting exercise to examine what such setback distances would mean in practice. Each of the maps below illustrates the extent of the land area in the Republic of Ireland that would remain following the introduction of these exclusion buffers. In the case of the 500m setback, just under a quarter (23.75%) of the total land area of the country would remain available for new wind farm development. However, this drops to 13.8% for the 750 metre setback, 9.4% for the 1,000 metre setback, 5.2% for the 1,500 setback and 3% for the 2,000m setback. The vast majority of new wind turbines currently proposed in Ireland are between 100-150m in height. Therefore, in effect, the implementation of these setback distances would result in 95% of the country being excluded for the development of new onshore wind farms. It is clear from the maps below that majority of the land which would remain available for development is located in mountainous regions, largely along the western seaboard. While these regions do generally have the highest wind speeds, they are also some of our most important sensitive landscapes and tourist assets. 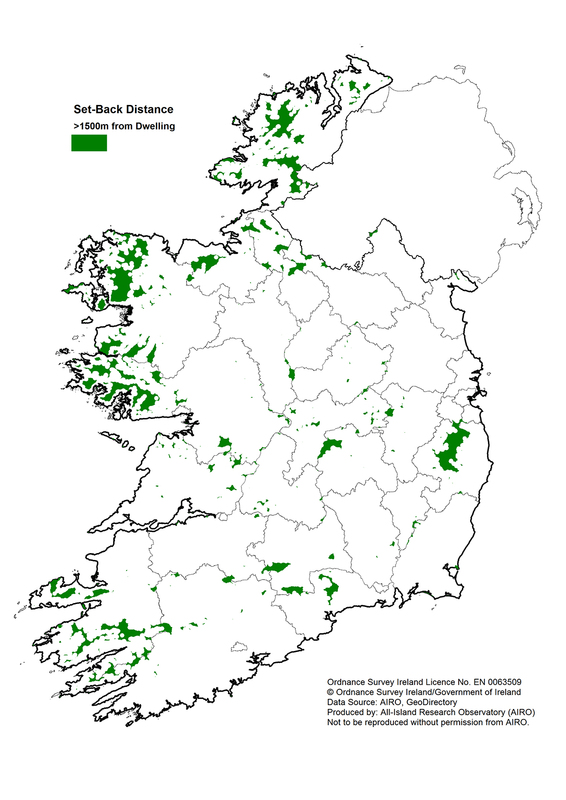 They are also the regions where there is the heaviest concentration of important EU designated nature conservation sites. Development in these protected sites is governed by the ‘Precautionary Principle’ where the threshold for permitting new development is set at an extremely high bar. In fact, taking the 1,500 metre setback distance, just 3.25% of the remaining land area lies outside of an EU designated conservation site. Ireland remains critically dependent on imported fossil fuels and, given energy security and climate change concerns, it is in the vital national interest that we progressively wean ourselves off oil and gas imports. In the short to medium-term, the achievement of Ireland’s renewable energy targets will require a massive ramping up of onshore wind farms. Currently there is approximately 2,000 MW of installed wind energy capacity in 176 wind farms on the island of Ireland (c.1,100 wind turbines). The Irish Government has an ambitious 2020 target of 40% renewable energy production which will, in broad terms, entail the construction of approximately 6,000 MW. This level of onshore wind energy development will require in the order of 3,000 additional wind turbines. Off-course, post-2020 Ireland will quickly have to move beyond 40% renewable energy production. Allied to this there is also an ambitious export agenda and Irish Wind Energy Association recently called for a joint government policy to facilitate the achievement of at least 3,000MW of on-shore wind energy to be identified as a minimum deliverable export potential for Ireland in advance of 2020. The proposed “Greenwire” project, which is currently at pre-application stage with An Bord Pleanála, proposes 3,000MW in 40 wind farms throughout the midlands using the world’s largest wind turbines. Mainstream Renewable Power’s “Energy Bridge” project proposes the installation of a further 5,000MW. 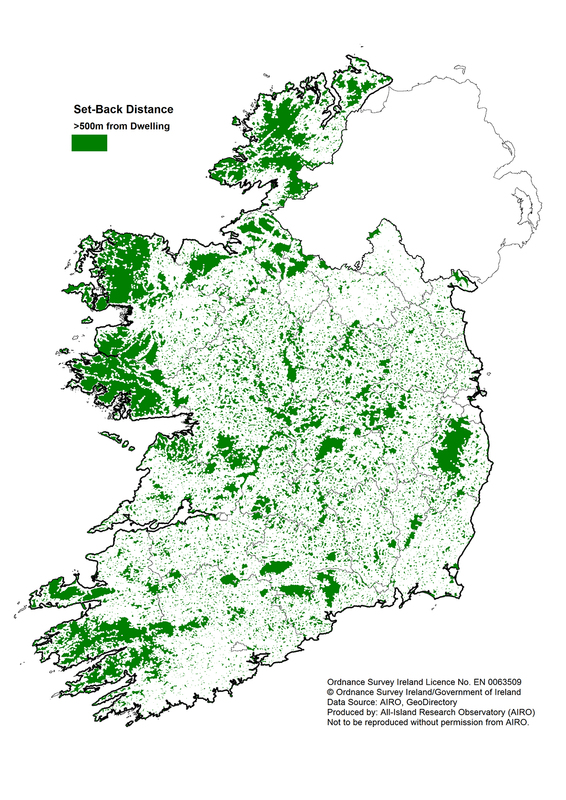 There may be a perception that Ireland is full of wide open spaces with plenty of uninhabited regions capable of accommodating new wind farms and associated grid connections. The reality is, however, that Ireland has a highly diffuse settlement pattern and rural Ireland is increasingly becoming a contested space. EU environmental law mandates that a high level of protection is afforded to many remote wilderness areas pushing new wind energy development into ever greater proximity to human settlement. Ireland has an abundant natural wind resource with the potential to deliver clean green energy to sustain our economy and society. However, in order to ensure competing interests are accommodated greater long-term strategic spatial planning is required. The recently published Strategy for Renewable Energy: 2012 – 2020 sets out a series of high-level actions to pump-prime the renewable energy sector. However, it fails to address these pressing and competing issues facing rural Ireland in any meaningful way.